Gaming fans will probably have heard of the Wolfenstein 3D video game and there’s good news today that ties in with the 20th anniversary of the game. For a limited time only the iOS app of Wolfenstein 3D is being offered free in Apple’s App Store for iPhone, iPod touch and iPad. The iconic Wolfenstein 3D has been the inspiration for the thousands of first-person shooter games that followed its original release 20 years ago. The free iOS Wolfenstein 3D app includes the six original episodes with 60 levels. 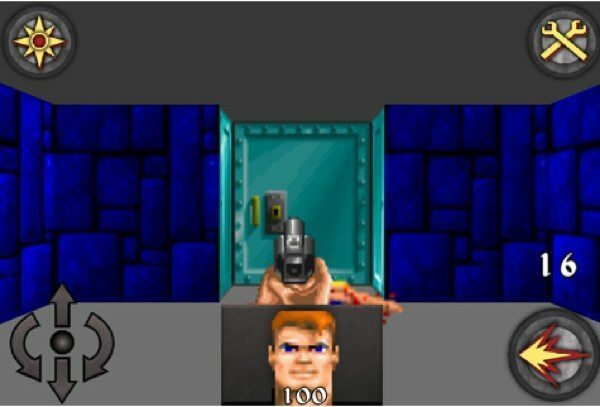 As well as the iTunes app id Software has also come up with a free browser version of Wolfenstein 3D that includes three episodes and 30 levels. For those of you that Wolfenstein has passed by, the basic premise of the game involves the player as a U.S. spy, BJ Blazkowicz and his attempts to escape Castle Wolfenstein, a World War 2 prison. Availability of the free app for a limited time came to us from BGR. The Wolfenstein 3D Classic Platinum app is compatible for iPhone, iPod and iPads running iOS 3.2 or later and you can download it from the App Store here. For the browser version head here. The iOS app involves non-stop action and features original weapons such as the brutal chain gun. Players of the original game will also remember old enemies such as MechaHitler and Hans Grosse. iOS players can see a new topdown map to keep track of where they’ve been and secrets through the various search levels enable the player to reveal hidden Nazi treasure, ammo, weapons, short cuts and health packs. Wolfenstein 3D Classic for iOS also utilizes a new control system designed specifically for the iPhone with new touch controls and also the use of tilt controls. We’d like to hear your thoughts on the Wolfenstein 3D iOS app so if you play the game let us have your comments. Does it bring back happy memories of one of your first gaming experiences?